One game to bind them all, chain them endlessly, to build deep into the night and forget about time! If you are by chance a gamer coming from the “old” glory days of building strategy games you’ll probably fondly remember names like Sim City, Transport Tycoon or The Incredible Machine. In this case you should just continue reading – or chances are you’re already playing Factorio anyways. 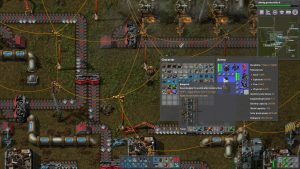 For everyone else that is not yet familiar to the concept of continuous (read: endless) improvement games: I invite you to read on as Factorio is one heck of a builder that will – once started – grab you tightly and not release you from its clutches until many hours later. Let’s start by defining what Factorio is by narrowing down its unique features. First of all It’s a game about automation and production. It feels like a bit of Transport Tycoon in the way that you automate transportation of goods from A to B, but in this case it’s not humans you transport (well aside from your own virtual self), but inanimate resources and produced goods that your own factories require and spits out in great amounts. 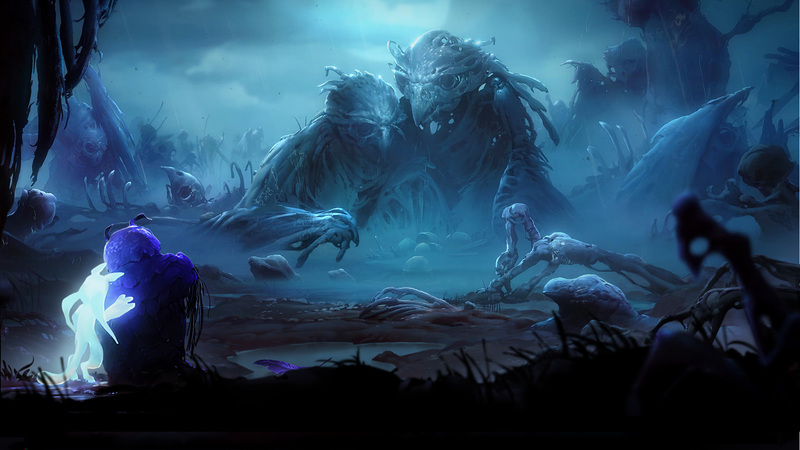 The added problem is: you are stranded on an alien planet and you are not alone. Therefore you seek to escape, trying to build the huge spaceship needed which in turn requires you to mine a LOT of resources and build VERY large factories. All this need for resources brings conflict with the alien wildlife, but more on that later. 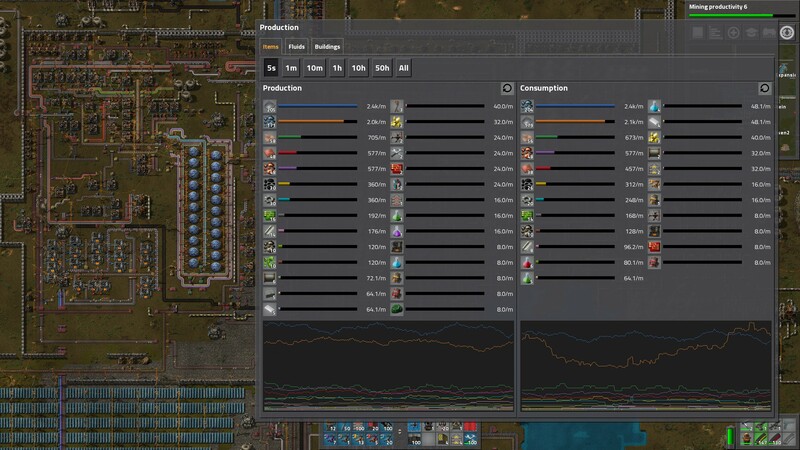 Factorio is all about solving, weighting and managing needs and problems correctly, which is where the similarities to Sim City and The Incredible Machine kick in: natural resources and pollution by your machinery are the only “currency” in the game which need to be carefully managed. You start slow and steady, by mining and cutting wood manually until you create your first mines, belts and machines to automate the tedious process. This in turn generates more output to use on bigger, more delicate chains of machinery. Very soon you’ll expand your possibilities with research, accessing an incredibly huge research tree that requires increasingly complex product chains in order to progress. It won’t be long and you run into first space, automation and timing optimization issues. It’s a weird mixture of excessive demand and satisfaction that keeps you energized and in the game from start to finish. 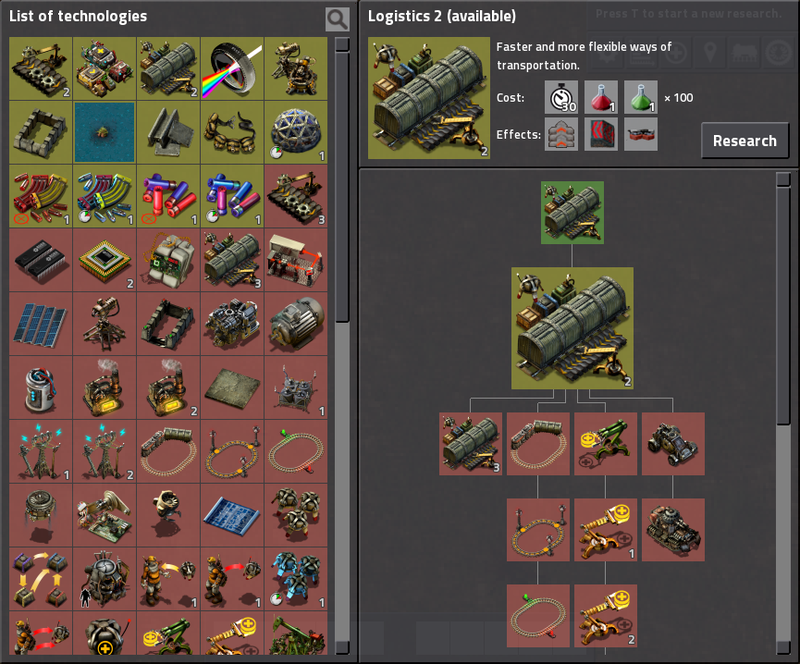 The tech tree of Factorio is impressive, but also logical to understand and break into separate goals. You only see a fraction of things to achieve here, but the search makes it simple enough to progress steadily and achieve new, more efficient means of production. A stats screen helps identifying problem. Of course you can also look at your production itself and see where things get stuck. 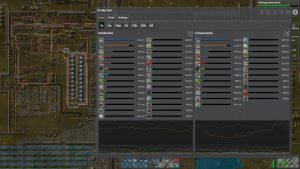 As you play you will realize that Factorio is also a steady fight against shortages: power, building space, resources – there’s always something to do and too little time to do it. It could be a sub-optimal building order that you later learned do much better, or soon-depleted resources that threaten to bring your carefully designed fancy machinery to a standstill. 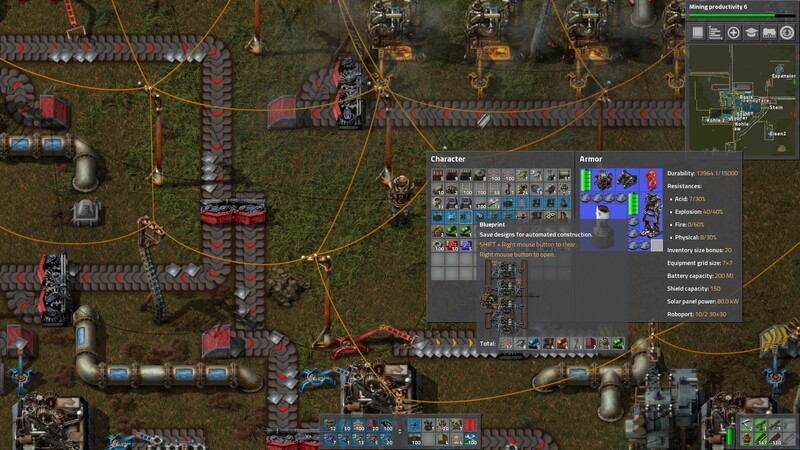 By transporting almost all goods visibly on conveyor belts, Factorio is quite clear about communicating the shortcomings. Stuttering production facilities or a simple statistics screen that shows your output also help to identify and solve the problems. One belt here, another mine there, removing redundancy in between – It’s a never-ending circle driving you to scratch that optimization-itch you never believed to have before. Very much like an “incredible” machine there is a hidden beauty behind finding your own unique solutions to problems and there always seems to be that room for improvement in your building strategies. As you progress and improve upon your growing production, conflict with the indigenous bug-population becomes inevitable. These “biters” are attracted by pollution or your general proximity, attacking in greater numbers as you expand your factory and – inevitably – increase pollution levels. This makes expending resources for defensive structures a necessity as your arsenal needs to keep up with the increasing threat. Where handguns and submachine guns are sufficient at the beginning you’ll soon face bigger, more resilient biters that are mostly immune to normal gunfire and will attack from all directions of your huge base. So very much like your production you will want to automate your defenses, even putting robots in place to replace destroyed buildings – given that you took care of also producting and holding the according replacements in stock. Conflict with the “Biters” is inevitable. You have to build defenses around your production or you will quickly lose it again. This continuous conflict adds another source of stress to both your brain and carefully designed production chain. It’s therefore good to know that you can play Factorio in coop up to as many players as you want (or your computer can manage!). This helps to distribute the workload and give roles to your friends, allowing for enormous expansion and even more satisfying builds. If that isn’t your thing you can configure Factorio to every need, by either adding mods, generating different maps or designing your own. When fighting isn’t your thing, you can remove the “buggy” opposition completely and build in a creative mode. Or – if you are more inclined towards conflict and masochism – you can play against other players or enjoy hard scenario-maps and mods with restrictions that make the game even more challenging as it already is. The amount of customization in Factorio is incredible. Even the base game will give you weeks of content without installing any mods whatsoever. Factorio is a very well-optimized game, with many layers of complexity that require your full attention in order to enjoy all intricate details of this game. 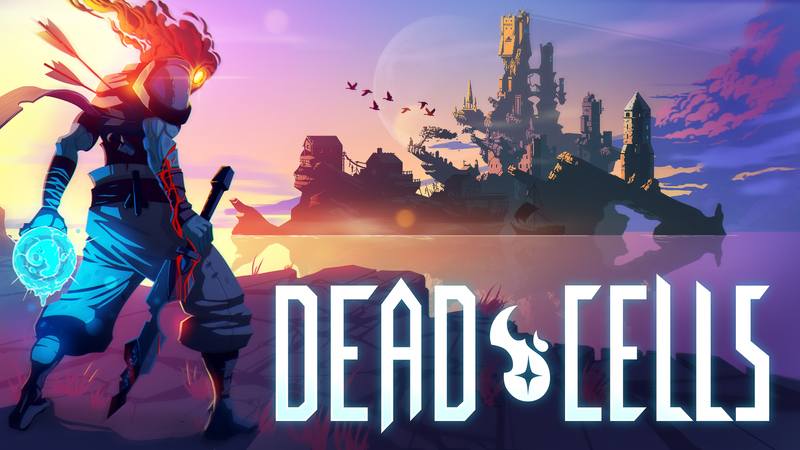 As this review was finished, the game recently left early access, but had a quality level that makes other strategy titles pale in comparison. The developers are constantly releasing very stable updates and extremely detailed patch notes that clearly show their love and understanding of both game and player base. This assertiveness resulted in a very memorable quote: “The game will never go on sale because they know its worth”. And while Factorio may appear simplistic and rather bland in its presentation, but it’s here to stay as a milestone among building & strategy games. 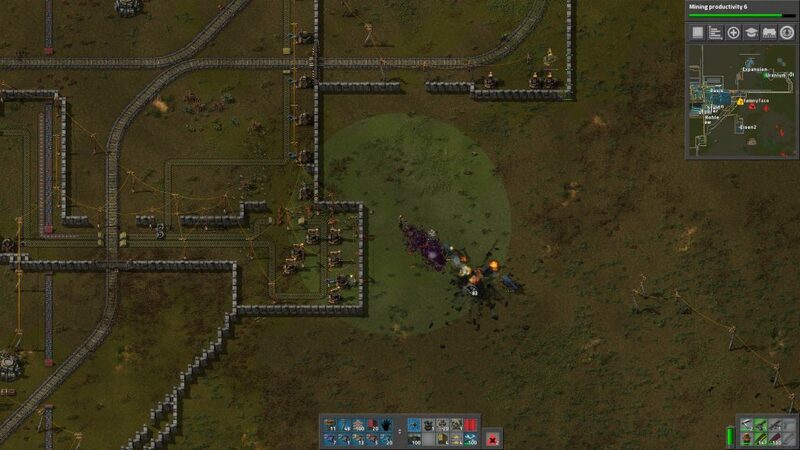 If you have but the least bit of interest in these kind of games, treat yourself to Factorio. It will be one of those game you’ll still pick up and play years later down the line and enjoy a great deal.